This new book is a collection of 13 popular Westknits designs by Stephen West filled with inspiring photos! Book Number 1 includes the following shawl patterns: Exploration Station, Dotted Rays, The Doodler, Vertices Unite, Striped Bolting, Starburst, Color Craving , Askews Me Shawl, Knit 'n Slide, Garter Breeze, Boardwalk, Holey Chevrons, and Briochevron Wrap. Book Number 2 includes the following sweater patterns: Amazing Technicolor Dream Sweater, Enchanted Mesa, Kangarullover, Kangarorts, Marled Magic Sweater, Parachutey, Penguono, Askews Me Sweater & Dress, Askews Me Dickey & Poncho, Watch Your Back. 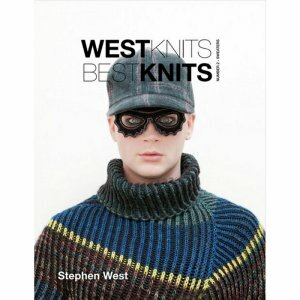 Sublime Books - 673 - The Luxurious Tweed Double Knitting Book and Sublime Books - 679 - The Third Luxurious Aran Tweed Book are both similar books: men and women category.